I'm trying to make a model where I make a copy of 'geodatabase A' to another location as 'geodatabase B', delete all of the datasets within, and create new datasets for geodatabase B. The reason I'm copying a particular geodatabase (geodatabase A) is because it contains all the domains I need for geodatabase B. However, I want to delete the datasets once it's copied so that I can reassign the spacial reference. When I put the copy tool and the iterate datasets together in one model, it iterated the copy function as well, making the model go infinitely. So now I'm thinking I need to put the iteration as a submodel. However, I'm not sure how I can reference the input for the iteration, as the input doesn't exist yet. Can someone help me or let me know a better way to do this? Expose "New geodatabase" in your delete datasets model as a parameter. Drag that model into your master model, which you appear to have called "Model 1". Connect the output of copy to the embedded sub-model. Not the answer you're looking for? Browse other questions tagged arcgis-desktop modelbuilder iterator or ask your own question. Using If precondition is false, continue iterating next input in ModelBuilder? Collapsing folder structure into single folder using ArcGIS ModelBuilder? 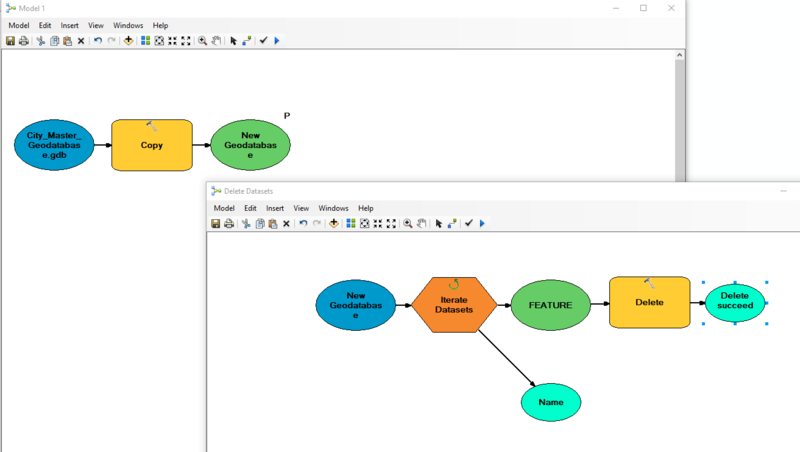 ArcGIS ModelBuilder iterator reports only last input shapefile? Creating ArcMap Model with multiple iterators?